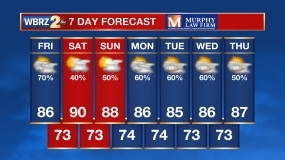 BATON ROUGE- The weekend forecast is not terrible, but it's not going to be great. WBRZ Chief Forecaster Pat Shingleton described it as "spotty." Shingleton said to expect rain Saturday between noon and 6 p.m.
Sunday, the rain returns as many people will be going or coming from church services, at 11 a.m. Rain accumulation from Friday through Sunday could reach about four inches in the Baton Rouge area. But, some coastal parishes could see as many as 6 inches of rain. Coastal flooding is a possibility this weekend. Click HERE for more on the forecast. Watch the attached video for Pat Shingleton's latest video forecast.